Some say seek knowledge even if it takes you to China. Some say seek knowledge even if you have to travel to China. Others say seek education even if you have to go as far as China. 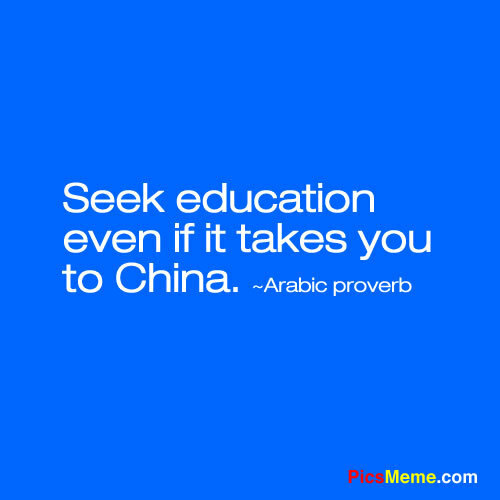 If relate this Arabic proverb in present time in the context of globalisation and internationalisation of economics and education, then it reads like "Seek education in China, a window to the world". Since the end of the Cultural Revolution (1966–76), the education system in China has been undergoing great reforms and geared toward economic modernisation. In Dec 1978, China opened its doors for economic reforms in light of globalisation phenomenon, worldwide competition, as well as efforts to realise the needs to transform its higher education to become top global education destination and hub. There is no turning back since then, China has set sights to capture bulk of the 4 millions international students worldwide and inching a step closer to catch up with United States and United Kingdom as a top study destination. The US is still the world’s leading destination. In fact, it is expected to enrol a record number of students again this year. But America’s market share is falling (from about 28% of all internationally mobile students in 2001 to 19% in 2011). This is partly due to the increasing share of other English-speaking destinations, such as the UK, Australia, Canada and now China which also offered English medium degree courses like medicine, engineering, business, international law and etc. 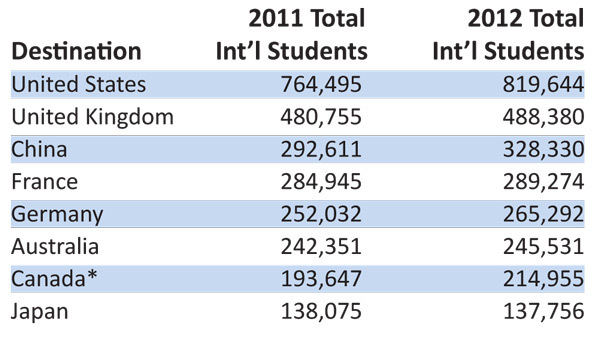 China captured a big chunk of market share of international students. 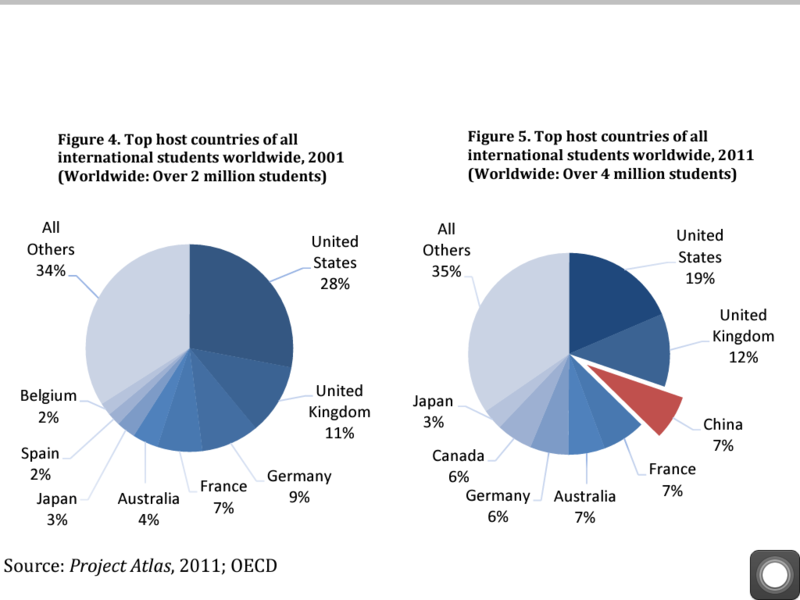 From "nowhere to be seen" in 2001, China had 7% of market share of 4 millions international students in 2011 at the expense of US due to its education reform policies to conduct tertiary education fully taught in English to cater for international students who prefer to study in English medium at the backdrop of Chinese medium degree courses. In 2012, China is home to 328,330 international students study in variety of disciplines at various universities across China. China now ranks 3rd after US and UK as the world's most-popular study destination. Bulk of the international students came from Korea with 21%, US - 8%, Japan - 6% and Thailand and Vietnam have 5% each study in China. Clinical medicine is the most popular choice of degree program preferred by international students. Came in second is engineering and followed by international economics and trade and Chinese language. One of the main reason of increase of international students in China is University World News reports that China’s top universities – most of which deliver significant programs in English – are seeing increasing numbers of overseas students from non-Asian countries in addition to the trend of where there has also been “a substantial increase” in the number of international students enrolled in degree programs delivered in Chinese due to expansion of Confucius institutions around the world with the aim to promote and encourage people to learn Mandarin. China economics values also attracted many international students to study in China. The Chinese economy has clearly been a global powerhouse for some time, but it is now pegged – by the World Bank and other leading statistical agencies – to overtake the US as the world’s leading economy in near future. Many global fortune companies have set sights in China and Beijing is now home to 48 headquarters of companies on the Fortune's Global 500 list in 2013. “China wants to go global,” notes a recent China Daily article. “What better way than to have foreigners pay for the privilege to do the job of spreading their culture and language for a fraction of the cost of running the Confucius Institutes around the world and generating goodwill in the bargain?…Chinese companies also want to go global. What better way than to find self-funding interns learning the ways of the Middle Kingdom and to employ them in their home countries?” This further added fuel and contributed the increase number of international students study in China. Back to education values, many Chinese universities are featured in the QS World University Top 200 rankings – “a confirmation and acknowledgement of the quality of academic standards of both teaching and research. 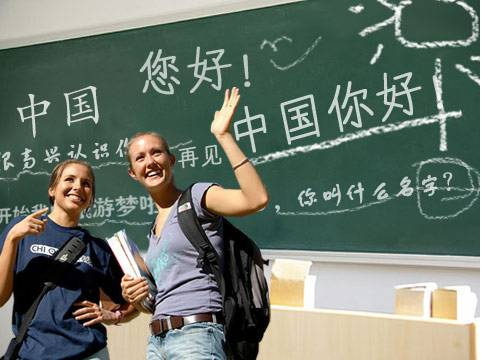 China higher education are internationally recognised. The clinical medical degree in China are listed in the World Health Organisation (WHO)'s "Directory of World Medical Schools". There are currently 187 medical schools listed on the list. This listing means that graduates are eligible to attend national medical screening tests such as USMLE, PLAB, AMC, MCI, PMDC, HPCSA, SCHS, etc. China government had signed China Government Mutual Recognition Agreements and this open up many windows of opportunities for students to seek employment after graduation or further study at postgraduate level in these countries. Chinese Universities also forged many academic collaborations and co-operations with many top rank and highly reputable western universities to enhance the quality of its academic and research. China is also home to many great philosophers and their wisdom teachings such as Confucius, Laozi and The I-Ching. The legendary of these teachings were dated back to around 6th century BC. Its teaching values are now highly sought and practised in real life in many countries around the world in particular the Confucianism has branched out to many countries with 1,082 Confucius institutes spread to all the continents. Last but not least, WHY NOT ENJOY THE BEST OF BOTH WORLDS? Below is the link of an article written by a Muslim girl from Indonesia which won the 1st prize of essay competition on the subject of "Seek Knowledge, Even If You Have to Go to China for It"